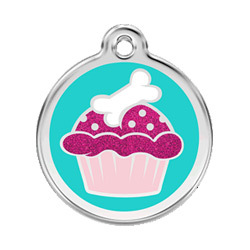 Incredibly cute cupcake dog ID tag with glittery pink icing on an aqua blue background. Perfect for special occasions or just to make every day special. 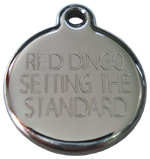 This hard-wearing polished stainless steel dog tag with glitter design is by Red Dingo and deep engraved in-house by them. This is size Small with a 20mm diameter. Also available in sizes Medium and Large. 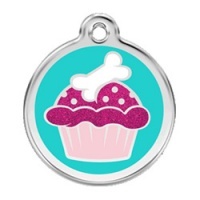 Tag engraving is included in the price. 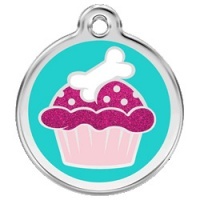 For this small tag your engraving can include up to 3 lines of text with 8, 10 and 8 characters (including spaces) on each line respectively. You can use as few or as many lines as you like but line 1 is required.